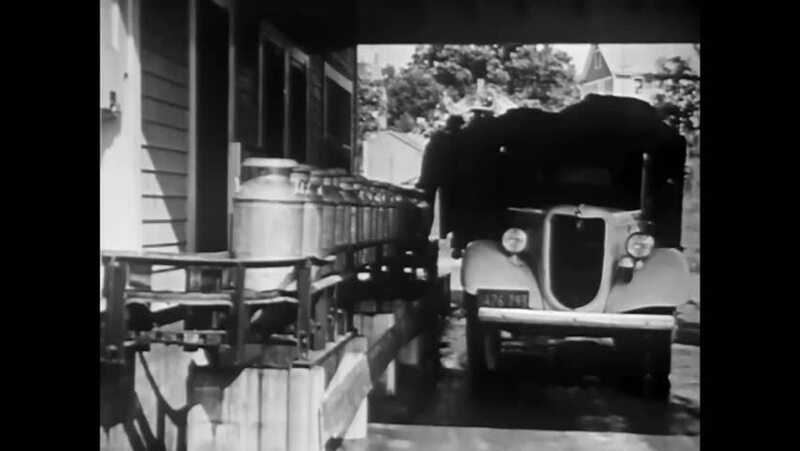 CIRCA 1920 - Cans of milk are dropped off at a dairy receiving plant. hd00:31CIRCA 1945 - A montage shows printed publications and churches in America, highlighting the Constitutional freedoms of the press and religion. hd00:241950s: UNITED STATES: girl helps mother with chores. Lady opens photo album. hd01:35CIRCA 1940s - A revolving cleaning machine is shown as well as resins and a Banbury mixer in a record manufacturing plant in Camden in New Jersey. hd00:281980s: Astronaut-researcher pulls sample from storage contraption. Flying insects in contained area. Space shuttle lands at White Sands Missile Range in New Mexico. Space shuttle launches. hd00:19UNITED STATES, 1948: Flashback ends and teen girl continues talking. hd00:18UNITED STATES 1950s: Man in film library / Woman is fitted in dress, twirls. hd02:16CIRCA 1950s - Radio has made possible communicating the results of the elections and quickly spread the news of the king?s abdication in 1936.